NOTICE TO END USER: CAREFULLY READ THE FOLLOWING TERMS AND CONDITIONS. contents to the location where you obtained it for a refund. reasonable steps to prevent unauthorized copying or distribution. COPY, IN WHOLE OR IN PART. with a dated proof of purchase; it will be replaced free of charge. FOR ANY PURPOSE, THEIR QUALITY, THEIR MERCHANTABILITY, OR BOTH. OR OTHER DAMAGES FOR BREACH OF WARRANTY. © Copyright Key Voice Technologies, Inc., 1991-1998.
lightning or other incidence of excessive or insufficient voltage or failure to follow instructions. REMEDY SHALL BE ONLY AS STATED HEREIN. systems are collectively referred to as the Lite system in this guide. 1.1 What Does the Lite System Do? These two functions work together to provide smooth call coverage for your application. 1.1.1 What is an Automated Attendant? Answers an incoming call by lifting telephone. greeting, "Welcome to [XYZ Company]." Asks to whom the caller wishes to speak. Listens to the caller's response. Listens to the digits dialed by the caller. Plays a pre-record phrase "Please hold..."
and dialing the extension number. Listens for busy tone, ring tone, answer, etc. to take a message or try another extension. offering to take a message or try another extension. 1.1.2 What is Voice Mail? In contrast, the Lite system records a message from a caller and places it in a voice mailbox. messages compared to a live attendant. message, writing it down on a piece of paper. electronically in the recipient’s voice mailbox. message waiting lamp on recipient's telephone. retrieves message slips from message mailbox. dials the Lite system to retrieve messages. Recipient reads messages left on message slips. callers in the voice mailbox. callers, and routing calls to certain extensions based on digits dialed by callers. Office products, but it is limited in the number of boxes you can set up on the system. defaults function on the Lite system. general system setup default configuration. provided in the Installation and Maintenance Manual. This document provides instructions for using either system setup technique. steps through the screen interface. the default database included on the Lite system unit. PC’s parallel port. This key is shipped in the packaging with the Lite system unit. maintenance of the Lite system. mean “PBX or Key System”). The Lite system unit can be connected directly to the telephone lines as shown below. used if the telephone lines are terminated with RJ-11 (single line) jacks. these capabilities, contact the local telephone company. assigned. Once again, if in doubt, contact the local telephone company. more extensions on the PBX. used if the PBX extensions are terminated with RJ-11 (single line) jacks. doubt, contact the local PBX manufacturer’s representative. Lite system unit’s COM 1 port. a DSUII (Impact 24, 48, 72), attach the serial cable to COM 3 on the DSUII. the Lite system transfers the call just as a live attendant would. information from the system supervisor. particular day, enter 0:00 on both lines. Photocopy this page, then complete the form for each subscriber who is to have a mailbox. schedule, as indicated on his/her Subscriber Mailbox Information sheet. indicate the wording for the greetings you want this Lite system to voice. pressing that single-digit number should be transferred. PBX Setup utility and to complete System Information and Box Setup screens. displays indicating the installation is complete. You connect the Lite system unit to the laptop computer using a null modem serial cable. COM 1 port if you are using the Debut system. directory, then type REMOTE and press <Enter>. 2. A screen displays, prompting you to indicate the type of connection you are establishing. To indicate you are using a null modem cable connection, type N then press <Enter>. monitor of the laptop now effectively control the Lite system unit. <Enter>. Repeat steps 2 and 3. 4. Follow the procedures in this document to set up the Lite system. 5. To break the connection between the laptop and Lite system unit, press <Ctrl>-<Break>. screen refreshes. 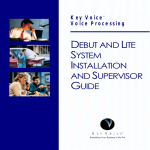 To re-establish communication with the Lite system, repeat step 1.
or contact Key Voice technical support. installation parameters for each specific customer’s site. section 2.5.5 for information on specifying system information. screen interface, use the following procedure. 2. To switch to the VM directory, type CD\VM then press <Enter>. 3. To invoke the Install program, type INSTALL then press <Enter>. is not on the list, select option 0 DON’T KNOW (OR UNLISTED) then press <Enter>. 9. The system prompts you to confirm your selection. To continue, press <Y>. 10. At the system prompt regarding message waiting lights, press <Y>. system. Enter the appropriate number, then press <Enter>. 12. The system prompts you for the number of digits you want to use in mailbox passwords. 13. The system prompts you to confirm your selection. To continue, press <Y>. for each user. To continue without setting up mailboxes at this time, press <N>. information. Enter the appropriate responses. years, press <Y>. If you do not want the system to automatically adjust for U.S.
17. The main Install program screen displays. To continue, select Exit then press <Enter>. 18. The Install program must reboot the Lite system unit to make the changes indicated. Note that you can access online help at any time by pressing <F1>. customize the phone system defaults, you probably do not need to modify these settings. 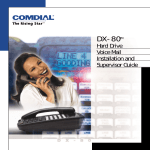 the Installation and Maintenance Manual and the technical bulletin for the phone system. associated bulletin numbers, request document 01.
prompted to enter a system password. the time at which the Lite system should exit to DOS to perform its auditing functions. The default setting is 3:00 AM. 2. Press <Enter> to move the cursor to the Initial Box field under Day Service for line 1.
hours are to go to Routing box 800. 3. Press <Enter> to move the cursor to Initial Box field under Night Service for line 1.
hours are to go to Routing box 801. 4. Press <Enter> to move the cursor to the Initial Box field under Lunch Service for line 1.
are also to go to Routing box 800.
this field is set to No. verify that Yes in the OUTGOING ALLOWED field. completed by the system supervisor for specific information. transfer calls (the “!” signifies hook-flash and the comma signifies pause for one second). they are different from those shown, make the changes as necessary. Routing box greetings, etc. See section 3 for details. service and go to the setup screen for class of service 7.
mailbox, the mailbox inherits all the privileges and restrictions defined in the class of service. purpose for the class of service. Sample names include Supervisors, Subscribers, etc. extension is not available..." The default setting is 10.
this parameter must be set to at least 2 in the supervisor mailbox class of service. the length of the new greeting to the value entered in this field. The default setting is 60.
maximum number of messages that can be stored in mailboxes assigned this class of service. in the mailbox are told that the box is full. The default setting is 200.
leave for mailboxes belonging to this class of service. The default setting is 60.
deleted at midnight on the day following the day the message became old. since accumulating messages may create disk storage problems. The default setting is 30.
the day following the day the message was received. messages are deleted whether or not the mailbox owner has listened to them. privileges. A supervisor can perform certain actions not available to regular mailbox owners. default setting in class of service 0 is No, in class of service 7 is Yes. refer to the Installation and Maintenance Manual. The default setting is Yes. allowed to place outgoing calls from the mailbox. The default setting is No. or deny access to the P.A. feature for callers to mailboxes belonging to this class of service. options as part of their greetings, set this field to Yes so that the Lite system plays the menu. The Lite system users should retain the default setting No in this field. caller indicates that he/she wishes to speak with an operator. The default setting is 888.
extension, etc. The default setting is 2.
message, press 1. To try another extension, press 3, or to speak with an operator, press 0."). a message, press 1, or to speak with an operator, press 0." speak with an operator, press 0." the extension again. If it is busy, then the next hold prompt is played to the caller. these options to the caller. prompt recorded, it returns to the lowest number after the next try. The default setting is 3. (#146) is approximately 30 seconds. numbers, such as long-distance numbers. Digits field, the Lite system defines the number entered as a match. 1-900-555-1212, 1-900-123-4567, 1-900-111-2222 to be matches. Telephone number 1-901555-1212 would not be considered a match. to the Line Information screen, press <F10>. 2.5.6.1 What Is a Box? since no option was selected in box 821, the caller hung up. review and set up the Routing boxes and mailboxes. 2. At the prompt to enter the system password, press <Enter>. 3. From the Main Menu, select BOX INFORMATION. The Box Information menu displays. necessary boxes and make the required adjustments. Manual. You can also access online help on any screen by pressing <F1>. for the box number. Type 800 then press <Enter>. same entries as you did on the setup screen for box 800.
options, simply re-enter them here. You need to create a mailbox for each subscriber who will use the system to record messages. system does so by making a copy of mailbox 9994.
with the Page Number menu. for the box number. Type 9994 then press <Enter>. you move the cursor to this field, the various options are presented in a menu. several available options before recording a message. Lite system offers the caller options to hold, leave a message, call another extension, etc. Press 1 to accept the call. The parties are connected. CHOOSES OTHER OPTIONS field on Page 2 of the mailbox’s Mail Box setup screens. caller, provided that the greeting has been recorded. is treated as would any other call to that box. conferencing on voice mail ports). be sufficient. Review the settings shown, and make any changes you feel are necessary. For details, refer to the phone documentation and technical bulletin for the phone system. 9. Press <F9> to move to page 2 of the Mail Box setup screen. field is set to Wait For A Digit. <F10>. The program displays the Box Information menu. that will be used by subscribers on the system. 1. From the Box Information menu, select MAIL BOX. The Mail Box setup screen displays. 2. To add a new mailbox, press <F2>. first mailbox you want to create, then press <Enter>. mailbox is the same as the box number. 4. The Lite system creates the new mailbox by making a copy of the Prototype mailbox. The new mailbox is displayed on the screen. 5. Repeat steps 3 through 5 for each subscriber mailbox you want to create. 6. Once you create all necessary mailboxes, continue with the next procedure, below. now customize the mailboxes you created for each subscriber on the system. The procedure below identifies the fields you should be sure to customize for each mailbox. nearly all setup situations. Therefore, it is unlikely that you need to modify these fields. Box Page 1 setup screen displays. 3. To go to Page 2 of the Mail Box setup screen, press <F9>. The Page 2 screen displays. number remotely. Normally, access codes for outside lines are not required here. Use pulse (also known as ‘rotary’) dialing. Use tone dialing (the default). screen. Default is one second). Medium pause (equal in length to 4 commas). Long pause (equal in length to 8 commas). being able to call in and change the number. Can be used for punctuation and is ignored. system queues the request and re-tries every 10 seconds for approximately 10 minutes. paging may be useful if the pager is turned off periodically or is out of pager range. Lite system how long it should wait between re-calls. paging service. Do not confuse this with the pager-retry feature. Pager notification is available at all times. defined in the System Information / Business Hours screen. as defined in the System Information / Business Hours screen. on Page 3 of the Mail Box setup screen for this mailbox. overrides the call schedule set in the previous field. section of the Mail Box setup screen. there are new messages in his/her mailbox. Short pause (duration can be changed in Technical Information screen. able to call in and change the number. “choose any line in line group A, and dial the number 555-1212”). Hang up immediately after dialing the number (must be last character). machine, and proceeds to play each new message in turn. Voice pager. This must be the last character in the telephone number. 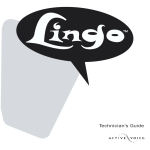 Details of voice pager programming are found later in this section. call progress tones during the course of the call. number, but cannot use or modify special characters. before proceeding to the next Call number sequence. Page 3 of the Mail Box setup screen for this mailbox. The Lite system does not deliver messages. but does not call to deliver non-urgent messages. Setting this field to DISABLED overrides the SCHEDULE field. 6. To go to Page 3 of the Mail Box setup screen, press <F9>. The Page 3 screen displays. following information to complete the Mail Box Page 3 setup screen. entered in 24-hour format (for example, enter 20:00 for 8:00 PM). in 24-hour format (for example, enter 20:00 for 8:00 PM). time and 24:00 as the END time. 3. To go to Page 4 of the Mail Box setup screen, press <F9>. The Page 4 screen displays. they can then use when sending messages to groups of subscribers. prompting you for the box number. Type 70 then press <Enter>. is currently acting as the on-site system supervisor. 4. To go to Page 2 of the Mail Box setup screen, press <F9>. The Page 2 screen displays. 6. To save all mailbox customizations and exit the Mail Box setup screen, press <F10>. The Box Information menu displays. greetings for these boxes and for box 821 are provided in section 3.2.1.
identify any single-digit call routing options available to the caller. default password for the mailbox is the same as the mailbox number, 70.
changing the password, be sure to inform the system supervisor of the number you select. 4. From the Options menu, press 2. 5. When prompted, press 800 to indicate you want to work with Routing box 800.
follow the prompts to record the office open greeting. number 1, and record the holiday greeting. greeting, instead of the office open greeting. menu, then press <#> to return to the Main menu. changing the active Routing box greetings and recording new greetings. settings affect system functionality is provided earlier in this document. system and resolve any call processing issues. AUTO-DELETE OLD MESSAGES AFTER 30 DAYS. AUTO DELETE NEW MESSAGES AFTER 99 DAYS. ∗ Set up with the class of service 0 options, but with SUPERVISOR STATUS? enabled. section indicate the parameters and their associated codes. complete all necessary system setup steps. setup of the default database included on the Lite system unit. information you entered. When the system reboots, your call into it is disconnected. sticker on the bottom of the unit. in a comprehensive table shown in section 2.7.2. When you complete all modifications, press # to return to the Supervisor’s menu. parameters and for information on adjusting parameters in the VM.CFG file. the Installation and Maintenance Manual. To record Routing box greetings, follow the procedure provided in section 3.2.2.
the Item number prompt, enter the number of the box. field of these screens, refer to the Installation and Maintenance Manual. information after this table for additional entries you can make in some fields. valid answer to question 10.
valid answer to question 1.
valid answer to question 2.
valid answer to question 3.
valid answer to question 4.
valid answer to question 5.
valid answer to question 6.
valid answer to question 7.
valid answer to question 8.
valid answer to question 9.
screens, refer to the Installation and Maintenance Manual. menu options (and not the Teleparameter feature), refer to section 3.
provided a code number (located on the invoice), which you must enter into the Lite system. This code enables the additional 2 ports for service. To enter the upgrade code, use teleparameter 4001 as described earlier in this document. When prompted, simply enter the code provided on the invoice. 3. From the Supervisors menu, press 1 for Mailbox Administration. 4. When prompted, enter the number of the mailbox you want to add, modify, or delete. The system voices the number back to you. same as the mailbox number. Follow the prompts to complete the procedure. already passed through box 800 or 801.
options differ between box 800 and 801.
in both box 800 and 801. 3. From the Options menu, press 2.
by following the procedure provided later in this section. the prompts to complete the procedure. prompt stating the greeting number and voicing the now-active greeting. procedure in section 3.2.2 to update the greeting as necessary. 3. From the Supervisors menu, press 2 for Routing box Administration. 4. When prompted, enter the number of the Routing box with which you want to work. prompt identifying the current call routing set up for the digit. system voices a prompt stating the new call routing structure. Note that you can make special call routing refinements by pressing * in step 8 above. previous menu, simply make no entry when you hear the special routing options prompt. 3. From the Supervisors menu, press 4 for Port Administration. 4. When prompted, enter the number of the line with which you want to work. 7. To enable a port that is currently shut down, press 2.
new or old messages in subscriber mailboxes. 4. To record a broadcast message, press 2. Follow the prompts to complete the procedure. system attempt to ring the mailbox’s associated extension. 1. Press the TRANSFER key on the telephone. 2. Dial the number for voice mail or press the voice mail hotkey. 3. Dial the number of the mailbox to which you want to transfer the call. 4. To divert the call directly to the mailbox’s voice mail, press *. 5. Hang up the telephone. Time and date the problem occurred. Box and extension number(s) affected. Action taken since problem occurred. Note the actions taken that apparently invoke the problem. have been attributed to user error.